Makono, sitting outside his home in Chimphanga village, is among the Health Surveillance Assistants who help bring malaria prevention and treatment services to women and families in Malawi. Chimphanga, Malawi—Sitting under a tree outside his house in this village in central Malawi, Health Surveillance Assistant Makono is busy examining three-year-old Easter Jedesi. Easter’s mother, Venelesi Jedesi, brought her to Chimphanga clinic, as it is locally known, suspecting that her daughter could have malaria. Makono feels Easter’s forehead to check for fever while Jedesi explains her daughter’s symptoms. He runs through a series of questions with the 27-year-old mother, screening for malnutrition and listening to Easter’s lungs for fast breathing—a potential sign of pneumonia. 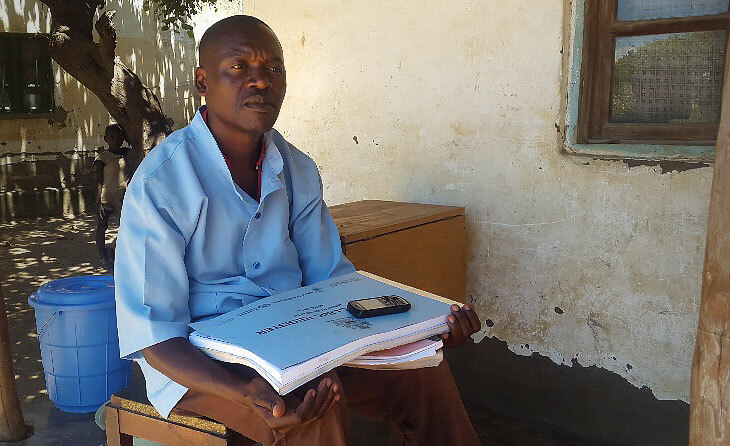 Using his Community Case Management register, Makono determines that Easter has a mild case of malaria. Easter doesn’t have a severe fever or other complications so she is given a common, three-day drug used to treat malaria cases in Malawi. 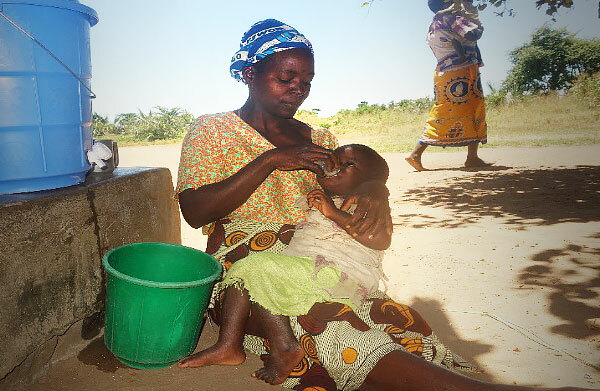 Makono asks Jedesi to give her daughter the first dose at the clinic and advises her to bring Easter back in three days for a follow-up visit. An easy treatment for what could have developed into a much more serious issue, if left unchecked. Makono is among 2,105 health workers being supported by the President’s Malaria Initiative through the U.S. Agency for International Development’s Support for Service Delivery Integration project. In collaboration with the Government of Malawi, the Jhpiego-led project trains health workers to diagnose and treat malaria, pneumonia, diarrhea and eye infections in children two months to five years old in hard-to-reach communities. The project also strengthens systems for maintaining malaria commodities so that communities like Chimphanga village do not go for long periods of time without drugs. Easter takes her first dose of the drug for malaria treatment outside of the Chimphanga clinic. Makono has worked in Chimphanga for more than five years, serving over 1,800 people, 375 of whom are children under 5. He is leading the village’s fight against malaria, educating families on prevention techniques, and teaching the importance of seeking early diagnosis and treatment as well as taking all of the prescribed medication. In Malawi, every pregnant woman receives a mosquito net during antenatal visits. At childbirth, the newborn also receives a net. Makono encourages families to sleep under these insecticide-treated mosquito nets—a critical intervention that can reduce child mortality by an average of 18 percent (U.S. Centers for Disease Control and Prevention 2014). He isn’t always working alone. A Village Health Committee helps encourage Chimphanga families to use the clinic, and organizes volunteers for tasks such as fetching water for handwashing. Mrs. Maunsamatha, a member of the Village Health Committee, recalls residents’ initial hesitation about the idea of a community health worker like Makono. “Some of us did not believe that a community health worker was capable of treating our children,” she says. “But we have been pleasantly surprised by Makono. Working from his home, Makono has helped to reduce under-5 child deaths significantly in the village. Previously, we had a lot of malaria-related deaths, especially during the rainy season. Now, things are different,” she says.